This series offers considerable reduction to occupied space while also including the standard UNION innovations and exclusive technical features. These models are equipped with five independent solvent tanks with round bottoms, designed to prevent moisture and associated bacteria problems, with a large front facing sight glass. Machines are equipped with 4 independent filtration systems allowing each wheel to utilize a light and dark filtration system along with continuous distillation. Solvent heating and Uni-Jet optional. LED front loading door and LED tank lights optional. 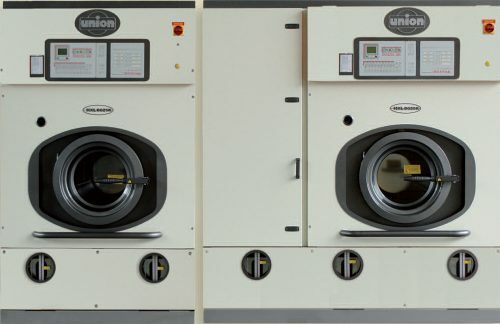 Union’s I-Connect system for machine diagnosis is optional. All models feature the electronic DRYING CONTROL system, & DIALOG Computer with DIALOG PLUS! The Brain! It's Indispensable! Union unleashes "The Brain! Dialog Plus™" - the latest advancement in computerized operation technology for drycleaning. With Dialog Plus™ run different multiple programs without having to change temperature setting or inverter drive speeds. Once the individual programs are entered Dialog Plus™ automatically remembers the settings for you. The Brain is loaded with amazing, time saving features. Another reason we call it "The Brain!" Easy plug-in microchips let you expand the capabilities. It is now possible to upgrade software, download data directly to your PC and copy programs from one machine to another. Innovation and Superior Performance Our high-effeciency, multi-stage inline water/solvent separation system assures maximum solvent quality control and purity. Large sightglass let you visually inspect levels at each stage of the separation process. The Ideal Drycleaning System For All Alternatives! Newly designed, drying chamber and refrigeration unit saves energy and reduces your operating costs.